Another weekend and another barbecue. If only the summer had been this lovely! Growing up, family barbecues consisted of fabulous food such as masala lamb chops, these shish kebabs and a variety of fresh chutneys. Imagine my disappointment when I was invited to a friend's house for a barbecue and was presented with a frozen beef burger and a frankfurter! Blitz the garlic, chillies and ginger in a food processor (or chop finely) and add to the minced lamb along with the salt and black pepper to taste. If the lamb is lean add a teaspoon of oil otherwise you probably won’t need it. Essentially if you can see flecks of white fat in the meat, don’t add any oil. Knead well and then knead again. 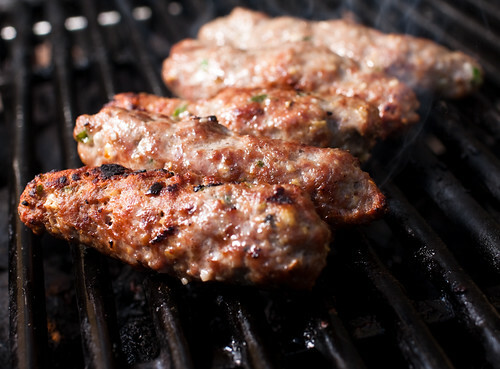 Shape into sausage shaped kebabs and then cook on the barbecue. Serve immediately with salad, pitta bread and coriander chutney. I've only made these once under the grill (it was raining and so we couldn't use the barbeque). They tasted okay but it definitely didn't have that chargrilled quality. Let me know if you give them a go and what you think. I will. I'll also make your Coriander Chutney to go with them.